List the 5 main types of pressure control valves. 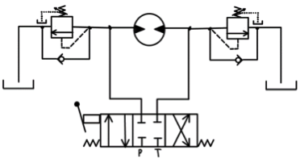 Draw their associated schematic symbols. Identify the 5 main characteristics used to classify pressure control valves. Describe the purpose of a pilot line. 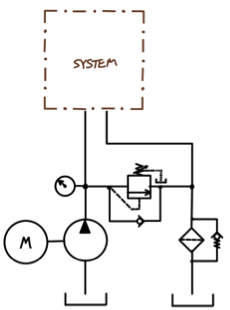 Describe the schematic symbol. Identify pressure control valves that make use of internal pilot lines on their primary, or input, port. Identify pressure control valves that make use of internal pilot lines on their secondary, or output, port. 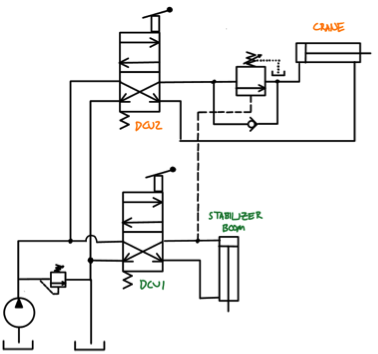 Identify pressure control valves that make use of external pilot lines. Identify pressure control valves that have a NC deactivated state. Identify pressure control valves that have a NO deactivated state. Identify pressure control valves that have a check valve bypass. Identify why a check valve bypass is necessary. Identify pressure control valves that do not have a check valve bypass. Identify why a check valve bypass is not necessary. Identify pressure control valves that have an internal drain. Identify why an external drain is not necessary. Identify pressure control valves that have an external drain. Identify why an external drain is necessary. Describe the schematic symbol for an external drain. Identify customary locations for the 5 main pressure control valves. Describe a sequence valve using the 5 main characteristics used to classify pressure control valves. 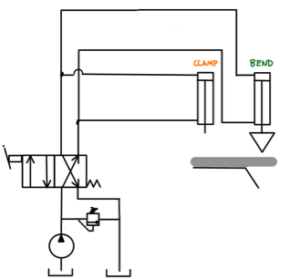 Describe how the orientation of the check valve bypass influences this actuator’s action. Describe the basic operation of a sequence valve. Describe operation of this multi actuator clamp and bend hydraulic circuit. 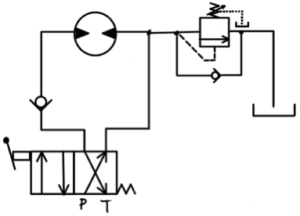 Describe the operation of this multi actuator hydraulic circuit making use of a sequence valve on the cap end of the bend cylinder. Assume the set value of the sequence valve is 400psi and the main pressure relief valve is set to 800psi. 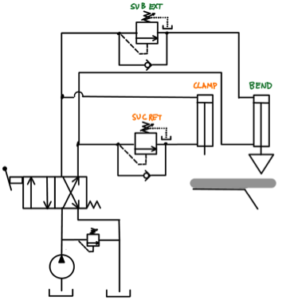 Identify potential disadvantages of coordinating actuation sequence using solely pressure input. Describe the operation of this multi actuator hydraulic circuit making use of a sequence valve on the cap end of the bend cylinder and another sequence valve on the rod end of clamp cylinder. Describe the operation of this hydraulic circuit making use of a sequence valve with an external remote pilot used to coordinate two separate actuators (stabilizer boom and crane) using two independent directional control valves. 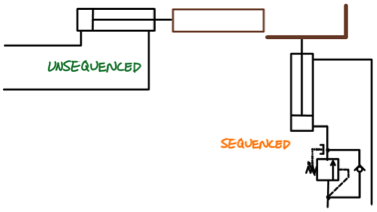 Differentiate between the operation of a normal versus a kick down style sequence valve. Describe the operation and advantages of this multi actuator hydraulic circuit making use of a kick down style sequence valve. 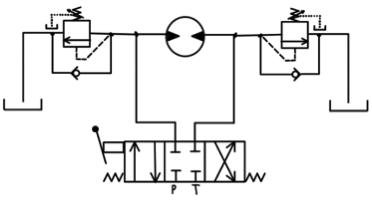 Describe how a sequence valve can present an advantage when used as a pressure relief valve in this hydraulic circuit. Describe how this sequence valve and check valve can be used to brake a unidirectional hydraulic motor. 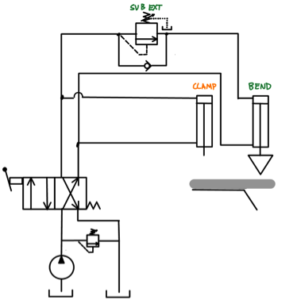 Describe how these two sequence valves can be used to brake a bidirectional hydraulic motor. Describe how the set value of the above sequence valves influences the deceleration rate of the hydraulic motor. Identify the purpose of a makeup check valve.